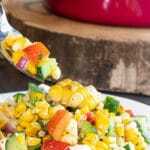 Super flavorful summer corn salad made with corn, straight off the cob, and tossed with fresh veggies, feta cheese, and a homemade dressing. Everyone loves this quick and easy salad! Turn your grill to high and get it nice and hot (500 degrees). Rub a little butter over each corn cob and sprinkle with a little salt. Wrap the corn cobs in foil and cook the corn on the grill till it gets tender. About 20 mins rotating ever 5 mins. Remove from the heat, take the corn out of the foil and remove the kernels from the cob, put it in a bowl to cool. Dice the peppers, onion, and cucumber in nice small piece. When the corn is cool add the veggies. Crumble the feta into the bowl. Chop the cilantro and add to corn mixture. Mince the clove of garlic either by using a knife or a small grater. Add the garlic and the rest of the ingredients into a container with a lid and shake. Pour over salad. Set the salad in the fridge for 1/2 an hour before serving.